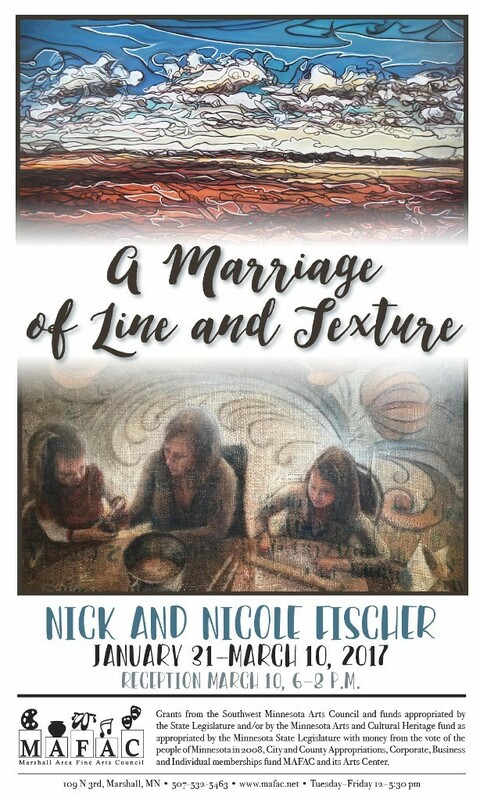 Nick and Nicole Fischer: A Marriage of Line and Texture. *Exhibit runs January 31-March 10, 2017. Reception on March 10, 6-8 pm. Marshall Area Fine Arts Council is located at 109 N. 3rd St, Marshall, MN. 507-532-5463. www.mafac.net. Gallery and Gift Shop open Tuesdays-Friday 12-5:30 pm. *Grants from the Southwest Minnesota Arts Council and funds appropriated by the State Legislature and/or by the Minnesota Arts and Cultural Heritage fund as appropriated by the Minnesota State Legislature with money from teh vote of the people of Minnesota in 2008, City and County Appropriations, Corporate, Business and Individual memberships fund MAFAC and its Arts Center.